Windows 8 is now running on at least 200,000 Apple Macintoshes -- iMacs, MacBooks and more. Although Microsoft won't ship Windows 8 until Oct. 26, test builds of the operating system seem to be spreading quickly on Apple's hardware. Windows 8 is now running on at least 200,000 Apple Macintoshes — iMacs, MacBooks and more. Although Microsoft won’t ship Windows 8 until Oct. 26, test builds of the operating system seem to be spreading quickly on Apple’s hardware. The evidence continues to flow in from Parallels, which makes virtualization software for running Windows and Mac OS X side by side or interchangeably on Apple hardware. Windows 8 Developer Preview on 78,314 Macintoshes. 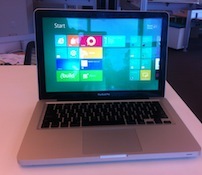 Windows 8 Consumer Preview on 83,708 Macs. Windows 8 Release Preview on 31,711 Macs. Obviously, those figures have climbed in recent weeks. Not long ago, Parallels had mentioned a figure closer to 100,000 Windows 8 deployments on Macs. The VAR Guy in recent days hasn’t had a chance to ask Parallels for current numbers. In the meantime, The VAR Guy continues to wonder: Will tablet, PC and notebook application developers jump on the Windows 8 bandwagon? Perhaps the Microsoft Build 2012 conference (Oct. 30-Nov. 2) will provide some answers.